Psychotherapy for Insomnia - Does it Work? Should You Consider Medication or Psychotherapy for Sleep Issues? This article covers how psychotherapy for insomnia can be an alternative and complementary option to help insomnia sufferers achieve the quality sleep they need for health and wellbeing. 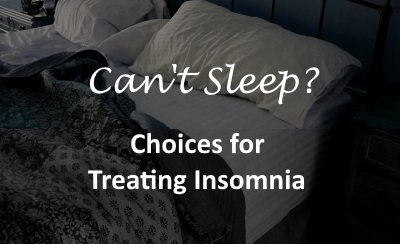 If you have insomnia, it’s important to know that you have many choices of what to do about it. The first step is to determine whether there may be an underlying medical condition or psychiatric disorder, such as depression, which may be contributing to poor sleep. Another consideration is whether one of the medicines you are taking may be affecting your sleep. If it’s found that a medicine is disturbing sleep, for instance, it’s appropriate to work with your doctor about possibly lowering the dose or changing medicines. Once these steps have been taken, it’s time to look into possible treatments. The most basic choice is whether to look into prescription sleeping pills or non-medicine "talking" approaches. There are a number of prescription medicines available to aid sleep. Each has certain benefits, as well as limitations, and they are described in books such as "Understanding Sleeping Pills" by sleep expert and psychiatrist Dr. Wallace B. Mendelson. An alternative – and complementary – way of addressing sleep issues is with psychotherapy for insomnia. The particular type that seems most effective, according to Dr. Mendelson, is known as cognitive behavioral therapy for insomnia, or CBT-I. CBT-I is based on the idea that many things can trigger disturbed sleep, for example, upsetting experiences or romantic unhappiness, especially in susceptible persons. There’s not much one can do about that – the experience has already happened. On the other hand, other factors can make the sleep disturbance worse, or perpetuate it, and these can be addressed. They can involve behaviors, such as having irregular sleep habits. Others can be psychological, such as becoming excessively anxious about sleep, or cognitive, for instance having inaccurate beliefs about sleep. CBT-I deals with all of these, by using a group of techniques, as summarized below. Establish a regular and consistent sleep schedule. An hour or more before going to bed, wind down with calming activities like reading a book or listening to soothing music. Don’t use electronic-screen devices in bed or before sleep. Avoid stimulants such as caffeine or nicotine in the evening. Arrange for the bedroom to be comfortable and conducive for sleeping. Avoid alcohol at bedtime; it may disturb sleep later in the night. Sleep Restriction: This is a method for dealing with inefficient sleep. With this approach, a person estimates how long he or she is actually asleep at night. Then the amount of time in bed is shortened to match this estimation. When sleep begins to fill this sleep window, the time in bed is slowly increased. Cognitive Therapy: This addresses unhelpful or inaccurate beliefs, which may be perpetuating poor sleep. One example might be blaming insomnia for all the difficulties one is experiencing, perhaps not considering conflicts at work or home. Stimulus Control: This approach is designed to help the association of the experience of going to sleep with the the place sleep normally occurs, the bedroom. Thus, one should eliminate from the bedroom all activities not helpful for sleep, such as paying bills or watching TV, or having unhappy conversations with a spouse. Relaxation Therapy: Here the idea is to learn to systematically relax all the major muscle groups, which can lead to a sense of peacefulness. Mindfulness: This involves learning to live in the present moment, dismissing worries about things that took pace in the past or might happen in the future. In choosing a form of treatment, it’s important to know that CBT-I and medications appear roughly equally effective initially. According to information detailed in Dr. Mendelson's book, "Understanding Sleeping Pills," most sleeping pills produce benefits more rapidly, but some studies suggest that their benefits are not as long-lasting as with CBT-I. It’s also possible to combine medication and psychotherapy for insomnia. Using the two together may reduce the time to better sleep, often in one week, compared to 2-3 weeks with CBT-I by itself. Some specialists suggest beginning with both treatments together, and then continuing CBT-I after later tapering off the medicine. The important thing to remember is that, if you have insomnia, there are a lot of choices for what to do about it. It is important to always seek the advice of a healthcare provider. And, the more you learn about your options for addressing insomnia, the better choices you can make.